searching outside the geographical area where the subject lived. A friend of mine is interested in descendants of Walter and Elsie CHATTERTON, who lived in England. A family tree on Ancestry suggests that they had a son, Reginald Walter CHATTERTON, who went to Australia. My friend was not able to contact the owner of that tree. This is how I helped her to find out more about the family. I found three of those entries easily, but variation in the spelling of the mother's surname meant that I only found the other two after seeing the names in the shipping record mentioned below. The following people with the same last name travelled on this voyage: Colin M., David M., Doris A., Johannes and Maria CHATTERTON. '1978' is the registration year. I could have found the exact death date by repeatedly changing the search's date range to narrow it down to a month and then a specific day; but I found the date by other means. 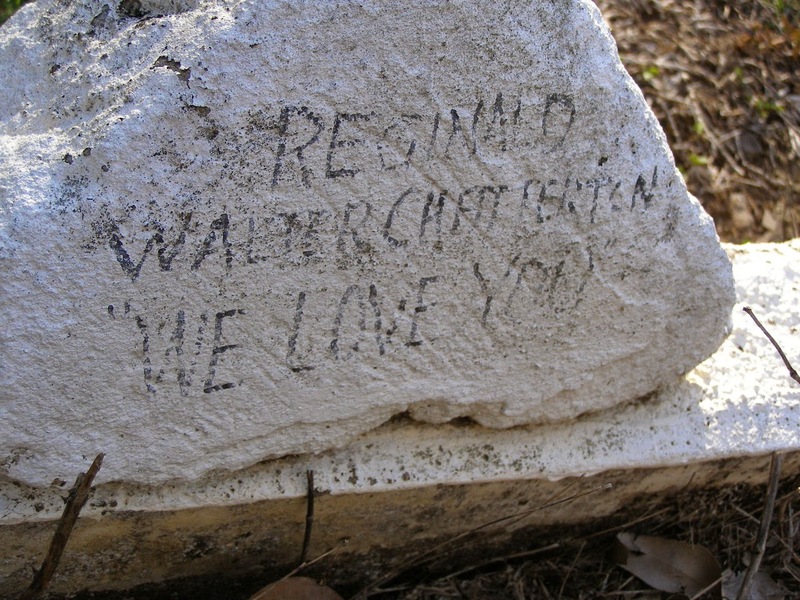 A 'homemade' grave marker for Reginald Walter CHATTERTON in Gheerulla cemetery says 'Reginald Walter Chatterton. We love you'. The next step would be to get death certificates for Reginald and Doris CHATTERTON. In Queensland, New South Wales and Victoria, death certificates are very informative. Family historians in the UK will be pleasantly surprised by the list of details shown on our certificates. Search indexes to Supreme Court wills and intestacies, and the most recent Commonwealth electoral rolls and State electoral rolls, as explained on Queensland Genealogy and Archives Research Tips. If there is no will/intestacy file with a copy of the death certificate, look for other Archives files that may include the certificate (see 'Free Certificates in Archives Files'). If all else fails, buy the certificate from the Queensland Registry of Births Deaths and Marriages. Sources listed above, and others including the Ryerson Index to recent newspaper notices, may help to locate living descendants. I am passionate about using original records in Archives, but as this case study shows, the Internet can certainly speed up the research process. I'm a big believer in crawling all over my family tree and researching siblings of my direct ancestors as well as the siblings and other family of their spouses. I have found out so much about my direct ancestors as a result. I lost my great great grandfather after he immigrated to the U.S. from Scotland. Tracing one of his nephew's passenger ship record provided my great great grandfather might be in Iowa. And sure enough he was. He'd left his first family, married another woman, and died there. I would have never known without that initial clue found by tracing his brother's children. Schalene, thanks for sharing that excellent example of how 'researching the relatives' can solve a long-standing mystery. Another great source is the National Probate Calendar for England and Wales (an index of wills and administrations that includes the names and whereabouts of vast numbers of people in other countries). Hello, thanks for leaving a comment on the World Wide Genealogy Blog. All comments are moderated because of pesky spammers! Copyright - The Authors of Worldwide Genealogy. Watermark theme. Theme images by Graffizone. Powered by Blogger.